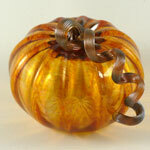 Autumn-green colored glass pumpkin. 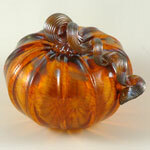 Each pumpkin is hand blown and signed by the artist. These squat pumpkins have a wide and short shape and measure 4-5" in diameter. Luke Adams creates unique works in glass by hand with a talented group of assistants at his studio in Norwood, Massachusetts. He graduated from the glass department at Massachusetts College of Art in Boston.